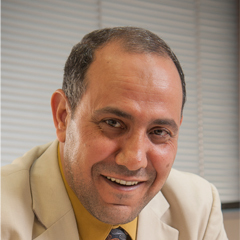 Dr. Abouelresh joined CIPR on Sep. 10, 2013. He holds long expertise in unconventional shale gas, sedimentology, and stratigraphy. From 2011 to 2013 he was an assistant professor of geology in Suez Canal University. Ph.D., Geology, Suez Canal University, Egypt, 2005. MS, Geology, Suez Canal University, Egypt, 1999. BS, Geology, Suez Canal University, Egypt, 1989. Unconventional Shale Gas, Sedimentology, and Stratigraphy. Abouelresh, Mohamed Omar. 2017. An integrated characterization of the porosity in Qusaiba Shale, Saudi Arabia. Journal of Petroleum Science and Engineering 149: 75–87. Abouelresh M. and L. Babalola, T. Al-Ghamdi, A. Al-Abdullatif, and H. El Hajj, 2016, Sequential Mineralogy Characterization of Organic-Rich Shale: Example from the Hanadir Shale, Northwest Saudi Arabia. SPE-SAS-182820, Conference Paper, SPE Kingdom of Saudi Arabia Annual Technical Symposium and Exhibition held in Dammam, Saudi Arabia, 25–28 April 2016. Abouelresh, M.O., Boyde, D., Babalola, L.O., Koithan, K. and Omer, M., 2016, Factors Controlling Natural Fracture development in the Qusaiba Hot Shale, Northwest Saudi Arabia; Outcrop Approach. Presented at Source Rocks of The Middle East, AAPG Geosciences Technology Workshops, Abu Dhabi, UAE, 25-27 Jan. 2016. Abouelresh, M.O. : Quantitative and Qualitative Evaluation of Micro-Porosity in Qusaiba Hot Shale, Saudi Arabia. Unconventional Resources Technology Conference URTeC/ 2154081, 20-22 July 2015, San Antonio, USA. Ejaz W., M. Ayyaz, M. Abouelresh, M.O. and A. Alshuhail, Petrophysical and Dynamic Geomechanical Characterization of Lower Silurian Qusaiba Shale, Saudi Arabia. 3rd SEG/DGS Middle East Geoscience Young Professionals and Student Event (26-28 April, 2015, Bahrain). Abouelresh, M.O. : Core Petrographic Sequential Analysis of Organic-Rich Shale, Presented at 2nd EAGE/SPE/AAPG Shale Gas Workshop in the Middle East, Dubai, UAE (21-24 Sep. 2014).